Greetings from Watson Lake! 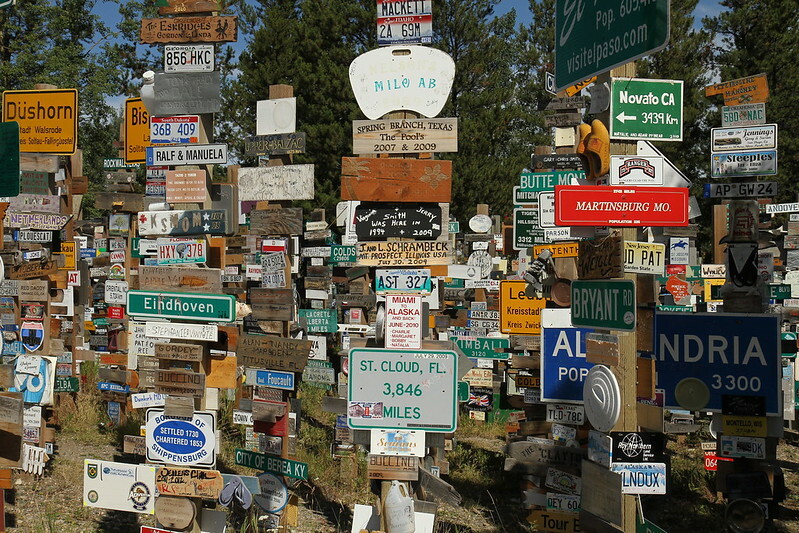 And a tourist trap called the Sign Post Forest, where old (and possibly stolen) signs come to rest. 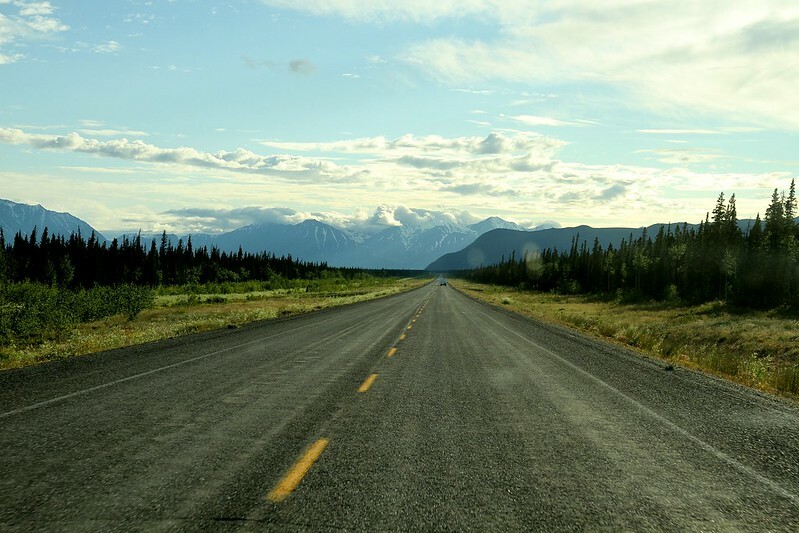 And off we go, through the Alaskan Highway westward, towards Whitehorse, YK. Tried to gas up at the local station at Dease Lake, BC, but found out that the station closed a few minutes before we got there. A guy on a motorcycle was around the pump talking to someone else who was trying to gas up, but no dice for any of us. We decide to push forward to the next town, since we had a lot of hours of light left for driving. The only problem, was that it was WAY further than I expected. And the needle of the gas gauge slowly started creeping down towards the empty line. And past it! I semi-panic while feathering the pedal up hills and trying to come up with Plan-C in case when we run out of gas. Turns out, that would be the least of our worries. We BARELY make it to Good Hope Lake (very foretelling), and coast into the empty (and closed) gas station. It looks like we’re stranded until it opens again the next morning, so Kat and I choose a flat spot and sulk over the time lost while we wait for gas. Meanwhile, the same moto-adventure rider comes up from behind us, and we talk for a bit. He’s out of gas too, and will pitch a tent closeby. Yay for neighbors! We’re amazed to find out that he spent several years in Manila, studying in an international school in Rizal. We would have never guessed, with his blue eyes and blond hair. 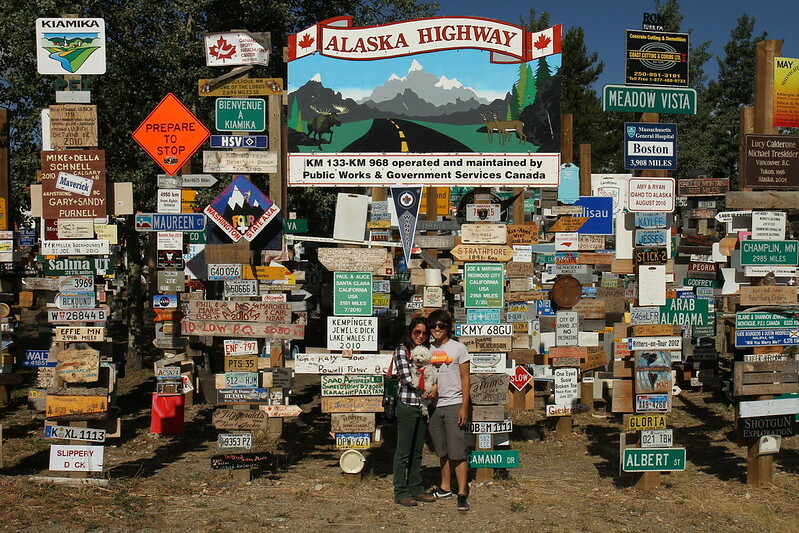 He bought his motorcycle less than 6 months ago, and is taking it from Denver to Alaska. These are the kinds of people we love meeting, and I offer him a cold Tecate as he begins to offload his gear. As we’re getting our stuff ready, a local pickup truck comes by after they notice us hanging out by the gas station. Long story short, there is a bear lurking around town, and the school house directly across the street was ransacked just the previous day. And that they did NOT recommend the guy sleeping in a tent around this area, unless you wanted to meet your end as bear-food. So they take off, and pick up the owner of the gas station who is their friend, to open the store and help us gas up. I gave them our last few cans of Tecate as a thank you gift (“What is this? Is it any good? I’ve never had Mexican beer before”). We thank the woman who owns the gas station profusely for opening the store just for us. While we’re settling our bill inside, we suddenly hear a loud BOOM of a shotgun. And it sounded close. “Oh.. They must’ve gotten him!”, the lady said. 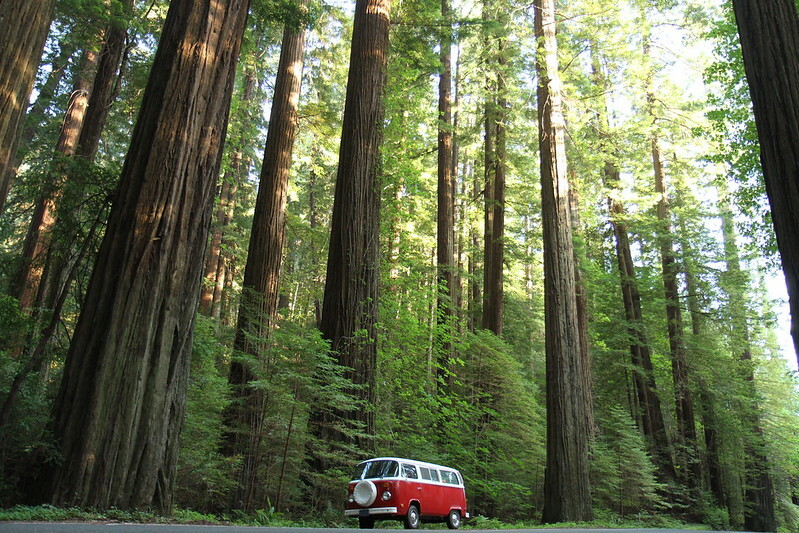 Taken along the way up the beautiful California redwood forests. We are much further along now, with a massive backlog of pictures and other things I wanted to share, even before the trip started. Not much time to sit, especially now that we’re so far away from home. I had wanted some semblance of chronological order to my pictures, but it is starting to push everything back. Shame, but what can you do when you’re literally more than a thousand miles away from your zip code, and momentarily call a breadbox your home? That and we’ve spent the last 4 nights in various degrees of forest, and after the physical and spiritual drain of slaving away over countless miles of asphalt in a 33 year old vehicle, I prefer not to look at anything else except for the soft glow of the moon and stars when we pull up into night. Don’t drive too fast along your road – there are avenues where giants like to roam. You might just miss them. To the thousands of miles, we look forward with anticipation. To the thousands of miles, we look forward towards the horizon. The Oregon coast is not a stranger to me, as I’ve traversed through the exact same route via Vespa several years back. Yet familiarity does not diminish character, as we pass through the quaint towns and say hello to fellow Bay Window breadboxes on the road and ride alongside the beautiful crashing waves of the Pacific. Exactly a year ago, I ended my 20’s with a bang and proposed to my beautiful girlfriend by surprising her and serenading her aboard a flight that we frequented between Los Angeles and Oakland. And in the rest of the year that kicked off my 30’s, I must say we’ve been off to a damn great start. Here we are now, a year wiser, quietly looking at the great adventures that lay ahead of us. One of the things I love the most about our relationship is how we manage to dream big, and take the small steps necessary to pave the way to our goals. In a few hours, we finally head off into our long-awaited honeymoon. 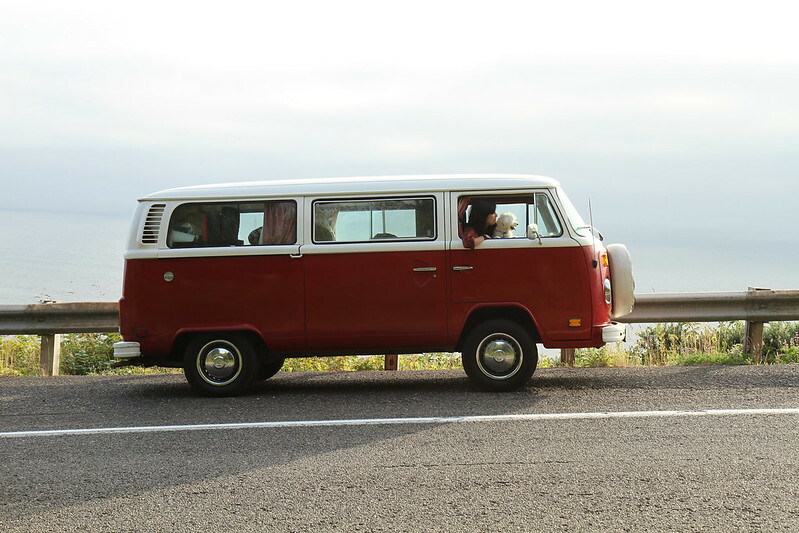 The plan is to take our VW bus, Vanessa, and our curious butts all the way north to Alaska. Dream big, or go home. And so, today is like any other. Because when you choose to live outside the shadows of fear, follow the little curious flame in your heart and quietly nurse them into the fires of passion, each day is like any other, because it will be unlike any other. It’s my birthday. We’re driving up to Alaska. Hold steadfast in your dreams, and may the gods guide you safely to the destinations that you choose. I’ve been primarily incognito, wallowing in filth, and sniffing all kinds of volatile compounds. We’ve been laying down serious hours in the garage, getting Vanessa in tip-top shape for the first leg of our honeymoon. A few days ago, we were paid a visit by Colin. He is a wandering VW ninja of sorts, the type that converts mere key-holders into full fledged owners of an air-cooled machine. And in a span of 9 hours, Kat and I found ourselves completely transformed, stepping into the enlightened role of Volkswagen owners, taking over the basics of maintenance and tuning onto our own hands. This has been, by far, the greatest preparation we have undertaken for this trip. Why learn ourselves, you ask? While I certainly agreed in the past that certain things should be left to experts (i.e. hire a damn mechanic), I have come to accept that owning an air cooled VW in this day and age simply cannot be (to a certain degree) entrusted to the supposed experts. With the type of travel we choose, and the situations we typically find ourselves in, there is no substitute for knowing to diagnose and having a basic understanding of your vehicle, when you find yourself stranded on the side of the highway in the middle of the night with no one to call. Another pertinent example, Colin pointed out that whoever had rebuilt my engine – I had pistons replaced a few years ago – had not bothered to warn me that two very important pieces of cooling tin were missing in the engine, one of which provides air to the oil cooler. If you want it done right, you really have to know, and do it yourself. I’ve taken Vanessa over several thousand miles since we got her in 2007, and while it’s always a blast taking her on the road, there is a constant fear and worry that sits in the back of my mind the entire time. Is the engine making weird noises? Am I smelling gas? Am I going to get stranded soon? This fear, was really just compounded by the lack of understanding. And so here we are, with thousands upon thousands of miles of pavement ahead of us. We took notes, tightened our bolts, and did our homework. Let’s do this. The hardships and poverty of my youth had been a good apprenticeship for this form of travel. I had been brought up to understand that material possessions and physical comfort should never be confused with success, achievement and security. Such an important lesson to learn. Not only in your youth, but each day you wakeup.. With a heart swollen with ambition, and the day pregnant with opportunity.